Michael Shumway Lee is an American lawyer and a United States Senator from Utah. He is a member of the Republican Party. 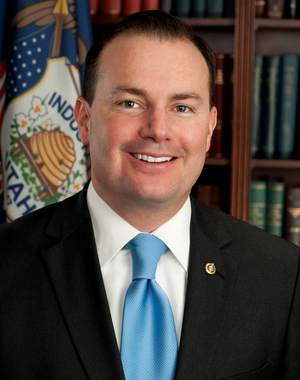 Lee was elected Senator in 2010, defeating incumbent U.S. Senator Bob Bennett in Utah’s state convention and then Tim Bridgewater in the primary election. He went on to win the November general election with 62 percent of the vote. He gained national prominence during the 2013 U.S. government shutdown that lasted for 16 days after he and Senator Ted Cruz (R-Texas) employed the strategy of demanding that Democrats agree to defund the new health-care law, or see the government shut down. The battle took a toll on his popularity. Some Utahns applaud his uncompromising approach. Others believe he was impractical and did the state a disservice. Lee is known for his connection to the Tea Party and his defense of constitutional principles. He is also recognized for his response to President Obama’s 2014 State of the Union address, which was sponsored by Tea Party Express, a political action committee. Lee gave the keynote, concluding remarks at the February 2014 National Prayer Breakfast, an annual event that began in 1953. Lee was asked to participate by the Fellowship Foundation, a conservative Christian group that hosts the all-day event. He had the opportunity to share his testimony of Jesus Christ and the power of prayer in his life. Lee is a member of The Church of Jesus Christ of Latter-day Saints. He was born in Mesa, Arizona, on June 4, 1971, but his family moved to Provo, Utah, when his father, Rex E. Lee, became the founding dean of the J. Reuben Clark Law School at Brigham Young University. Because his father also served as Assistant U.S. Attorney General during the Ford administration and then U.S. Solicitor General during the Reagan administration, Lee spent half of his childhood years living in McLean, Virginia. In 1994, Lee received his BS degree in Political Science from BYU. During his senior year, he served as student body president. His father was president of BYU at the time. He earned his JD from the J. Reuben Clark Law School in 1997. After graduating, he clerked for Judge Dee Benson of the U.S. District Court for Utah. The next year he clerked for Judge Samuel Alito, who was serving at that time on the U.S. Court of Appeals for the Third Circuit Court in Newark, New Jersey. After concluding his clerkships, he joined a Washington, D.C., law office where he specialized in appellate and Supreme Court litigation. He was invited to return to Salt Lake City, Utah, to serve as an Assistant U.S. Attorney. He prepared briefs and argued cases before the U.S. Court of Appeals for the Tenth Circuit. He served as general counsel to Governor Jon M. Huntsman, Jr. from January 2005 to June 2006. He then returned to Washington to serve a one-year clerkship with U.S. Supreme Court Justice Samuel Alito. In the summer of 2007 Lee joined the Salt Lake office of the law firm Howrey LLP, based in Washington, D.C. He focused on courtroom advocacy and constitutional law. Lee and his wife, Sharon, have three children. They live in Alpine, Utah. This page was last edited on 10 February 2014, at 15:14.